BOMB Thursdays is a new series of events started by artist and event management company ennui.BOMB that aims to address the lack of good venues for indie rock gigs in suburban Mumbai. BOMB Thursdays from ennui.BOMB and Kino 108. Held at Kino 108, a “retro restro bar” in Andheri, Mumbai, the first edition of BOMB Thursdays saw performances by the Shakey Rays (Chennai) and the Lightyears Explode (Mumbai). 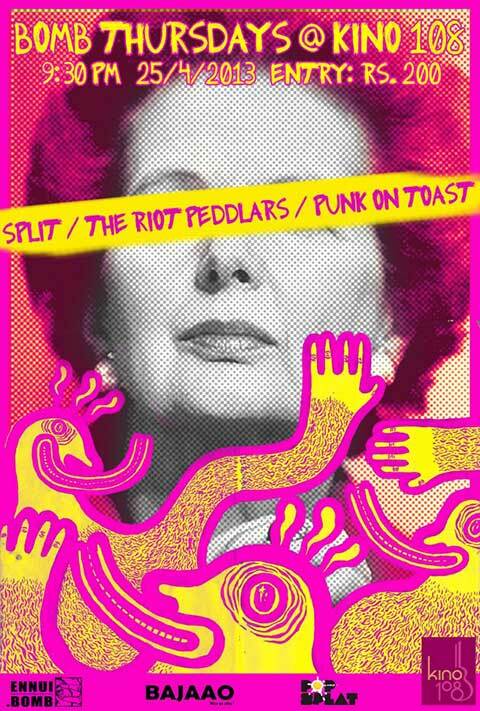 You can catch Punk on Toast, the Riot Peddlers, and Jack Daniel’s Annual Rock Awards 2013 nominees Split live tomorrow at Kino 108, as part of the fourth BOMB Thursdays event. By Solo · A book with a plot that cleverly weaves in emotions as the narration digresses from the usual fare of bloodthirsty violence. By Nicole Newby · Pentagram's fourth studio album suggests a parallel to the commercial world of Bollywood and the mainstream in general.